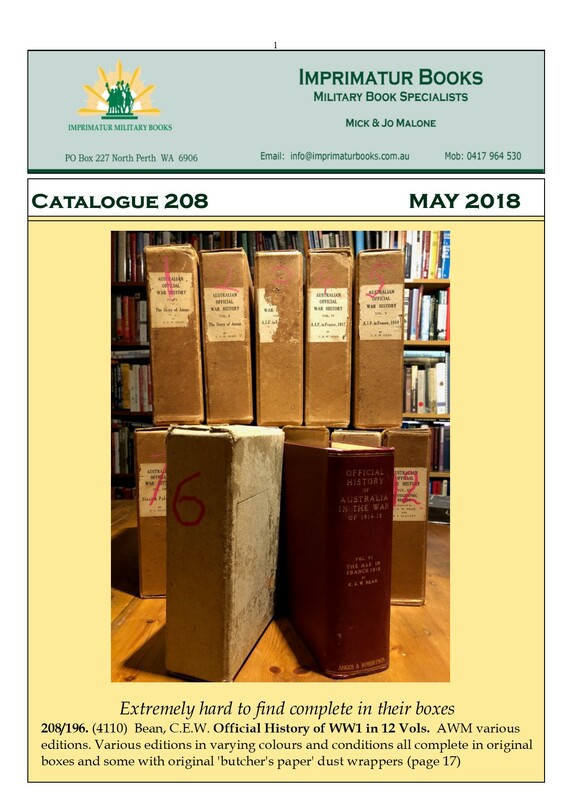 Welcome to Catalogue 208, May 2018. This is my “Post ANZAC Day” list and it is a time of great remembrance. For the first time in my long life I didn’t participate in anything this year. Watching it all unfold on TV was a new experience. Must admit I was a bit overcome to see my mates swinging down the Terrace in sandy berets, where I would usually be. The Dawn Service at Campbell Barracks was sorely missed also but I made up for it in catching all of the impressive Dawn Services on TV, Gallipoli and Villers-Bretonneux prominent amongst them. Villers-Bretonneux also showed off it’s new attraction the Sir John Monash Museum, built at the behest of the PM at the time, Tony Abbott. It’s an interpretive and very tech oriented museum designed to educate future generations on what happened on the Western Front and the decisive part Australian troops played in it. VB will go down in history as the turning point in the Western Front saga. We were very fortunate to attend the first Dawn Service on the Western Front in 2008 (the 90th anniversary). Kings Park here in Perth hosted 30,000 people to the Dawn Service on Mt Eliza and it was something to see dawn break over the beautiful Swan River. And the Noongar/Maori corroboree was sensational. Great respect for these ancient cultures. This list contains some serious titles prominent among the being the set of “Beans” (see cover photo). This is a remarkable find as they are still in their original boxes, some with the original butcher’s paper dust-wrappers. A rare find indeed and very well priced at $1,200. (saw a set in an auction last year that fetched $2,400 so this set is well priced). Also the new Graham McKenzie-Smith production “The Unit Guide”. 6 vols covering every Australian Army unit in WW2. ($185) Also note I have a copy of the rare “Wouldn’t Have Missed it For Quids” by Darryl Clohessy. He only produced a few of them hence the catalogue price of $475. This is only the second one I’ve ever had so I expect the unit history collectors to be all over it like a cheap suit. As usual this list is dedicated to all those Australians who have given their lives for this country and those who continue to do so. Always thinking of my mates who aren’t travelling well.